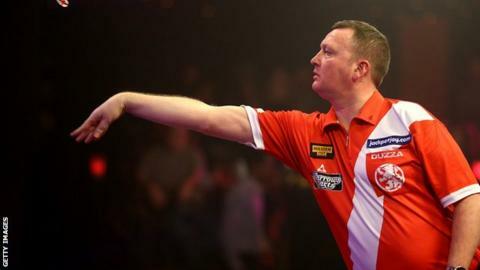 England's Glen Durrant beat Larry Butler 7-3 in Hull to win the BDO World Masters title for the first time. The 44-year-old from Middlesbrough, who was a semi-finalist at the BDO World Championship in January, won four sets in a row to move 6-2 up in the final. American thrower Butler, 58, pulled one set back but could not deny Durrant the biggest title of his career to date. Aileen de Graaf of the Netherlands beat England's double world champion Lisa Ashton 5-4 to win the women's event. Durrant lost a classic Lakeside semi-final to fellow Englishman Martin Adams at the start of the year, but he has recovered from his World Championship disappointment to win a host of events in 2015 and move to the top of the BDO world rankings. Durrant will enter the 2016 World Championship as the number one seed and will take on Dean Reynolds of Wales in the first round. Defending champion and sixth seed Scott Mitchell will face a preliminary-round winner in his first-round match. Adams, the man Mitchell beat in an all-English Lakeside final, will be paired with 2015 semi-finalist Jeff Smith if the Canadian comes through his preliminary-round tie. Three-time winner Adams is one of five Lakeside champions in the field of 40 male players, along with Mitchell, Scott Waites, Ted Hankey and John Walton. Hankey, the champion in 2000 and 2009, will make his first appearance at Frimley Green since losing at the semi-final stage in 2012 and then playing on the rival Professional Darts Corporation circuit for two years. Click here to see the 2016 World Championship draw in full.